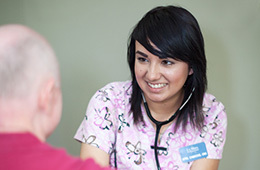 La Mesa Healthcare Center nursing provides comprehensive clinical care for our residents. We are experienced in IV therapy, tube feeding, pain management, orthopedic care, and intense wound care. We also deliver respiratory services for residents with chronic respiratory conditions. Other services include nebulizer treatments, CPAP and BIPAP application.